A boy suffering from cancer wants to complete what he began before…. Leslee Slinger knew this Christmas Eve would be the best ever: Her big brother was home. This would be the first holiday that Derek Slinger, 18, would not spend in a hospital since he was diagnosed with cancer almost a year and a half earlier. Derek jokes that come a holiday, even a minor one, he will always get sick. But this holiday he was home and Leslee couldn't stop smiling wide. “My brother is awesome. He's really cool,” she whispered, twirling a section of her auburn hair. Gangly and slender, the 12-year-old adores her big brother. He's goofy, she said. He also cares about others. A Boy Scout for 12 years, Derek had earned 51 merit badges. The last four years he'd been a counselor at the Rotary Youth Camp for disabled scouts. But his best talent was making his sister laugh, even when she was scared, and since Derek's diagnosis, she's been scared a lot. The brother and sister lost their parents years ago ---- both to cancer. Their Aunt Tammy raises them now in Raymore. But every holiday their entire family of aunts and uncles, cousins and grandparents, rally around them telling stories about how much their parents loved them. This Christmas Eve was no exception. But the night would be even more special than a holiday homecoming: The Elves of Christmas Present would surprise them with a Christmas memory they'll not forget. For 15 years the Elves of Christmas Present have sifted through heartache in the metropolitan area, trying to make Christmas extra special for a few families who have had a tough year. The Elves' gifts go far beyond the ordinary store-bought presents. True gifts, they say, are wrapped in sacrifice. The Elves are anonymous men, women and children who sacrifice their Christmas Eve by donating their time, talents and energies. They've discovered that within the 24 hours of Christmas, the impossible becomes possible. One year they synchronized 250 carpenters, electricians, finishers, roofers and plumbers to build a handicapped- accessible bedroom and bathroom for a mother whose arm and leg had to be amputated. Another year they took “mountains” to a Kansas boy who was too sick to travel to them. The Elves installed in his bedroom a wall-size painting of snow- capped peaks, complete with sound and lights. And once they gave a boy whose sister had died on Christmas Eve the ride of his life ---- and a happy memory to replace a sad one ---- delivering gifts with Santa Claus in a helicopter, landing in a cul-de-sac in Kansas. This year, Derek and Leslee's Christmas would involve tons of paper, 17 comic book artists from California to Florida, 20,000 coloring books, a midnight printing and one silver eagle from the Boy Scouts of America. A senior at Ray-Pec High School, Derek Slinger is well-known for his sense of humor. Besides being the student body president, he loves acting in plays, singing country music songs, “even bad ones,” and making jokes. Last Christmas, he was a patient at Children's Mercy Hospital. He had the nurses turn on the intercom on his floor, then he sang the Styx song, “Come Sail Away” as a gift for everyone there. With his optimism and upbeat attitude, nurses often ask him to talk with children who are newly diagnosed with cancer. “Well, one thing cancer's taught me, when you don't have hair there's no such thing as a bad hair day,” he said with a grin. But there were bad days. Living in and out of the hospital since he was 16 was not very fun. He tried to think of anything else than his cancer. He missed Scouting; he had a dream to become an Eagle Scout. And that's when his two experiences came together: Why not make a coloring book for sick children, one that would make them laugh, too? Plus, it would make an excellent Eagle Scout service project. His scoutmaster, Dan Barnes, liked the idea a lot. An Eagle Scout project is one that must have lasting significance. Coloring books certainly would have that. But Eagle service projects also have a deadline: To be eligible for the award, Scouts must complete their service projects before their 18th birthday. With his illness, Derek was spending more time at the hospital instead of coordinating the details of his project. In November, Derek traveled to Houston's M.D. Anderson Hospital to have a lung tumor removed. But when doctors opened him up, they found the tumor too large to operate on. They sent him home. With December came days of high-dose chemotherapy; nights of vomiting. But the hope remains that his tumor will shrink so doctors can operate. This week he will learn whether the treatments have worked. For Christmas, all Derek wanted was to be home. He had accepted that his scout project had failed, that he wouldn't make it to the Eagle Scout level. But everything changed when a man named Chief Elf called Tammy Slinger with an idea. Since November, Chief Elf's phone had rung with doctors, nurses, social workers and friends, all telling him about children or adults that could use a special Christmas this year. He heard about Derek and his dream to be an Eagle Scout, and after more phone calls knew he could help. He introduced himself to Tammy Slinger, who had raised Derek and Leslee the last nine years after their parents' deaths. He told her about talking with the Boy Scouts of America, who had granted Derek an extension for his Eagle Scout project, the coloring book, which the Elves wanted to help him complete. Already, one Elf was coordinating all the printing details: 2 tons of paper, printing presses for 20,000 copies, ink and binding. A slew of professional Elf artists stood by waiting to illustrate the book; Famous Elf artists from Universal Press Syndicate, he added. But the artists needed a theme to illustrate the book. He asked Tammy if she could persuade Derek to write a dedication to Leslee, so his sister wouldn't feel left out. In two hours, Derek wrote not just a dedication, but an 18-stanza poem, remembering the good times he and Leslee had before he got sick. The poem moved many adults to tears. And his words became the basis for the entire coloring book's theme. Kathie Kerr, the spokeswoman at Universal Press Syndicate who coordinated the artists, was stunned by how fast the project fell into place. The project was “one of those God things. ... You know ... meant to be,” she said. Deadlines were quick, and at the busiest time of the year. But everyone wanted to be a part of it, she said. “Fox Trot” creator Bill Amend was the first to respond to her e-mail. “I was an Eagle Scout, too,” he said, from his home in Kansas City. “I could relate in a small way, trying to get this project off the ground. By Christmas Eve, 700 coloring books were ready, with another 19,300 printing this week. The coloring books wouldn't just be given to Children's Mercy Hospital in Kansas City. They were going to every children's hospital in America. Around 6:30 p.m. Christmas Eve, the Slinger home was so full it looked as if it couldn't add any more people, but the doorbell rang again. Leslee opened the door. Her eyes grew wide. “Mom, there's some people here who say their elves,” she yelled, laughing at the twin boys, both wearing green hats with the words “Rookie Elf” embroidered on the front. The boys ignored her. They were here on a mission. They handed her two gifts. One was for Leslee, the other for Derek. “Merry Christmas,” they said, and ran off. The crowd of friends and family gathered near the door. As Leslee tore open the wrapping paper, Derek limped over to her. 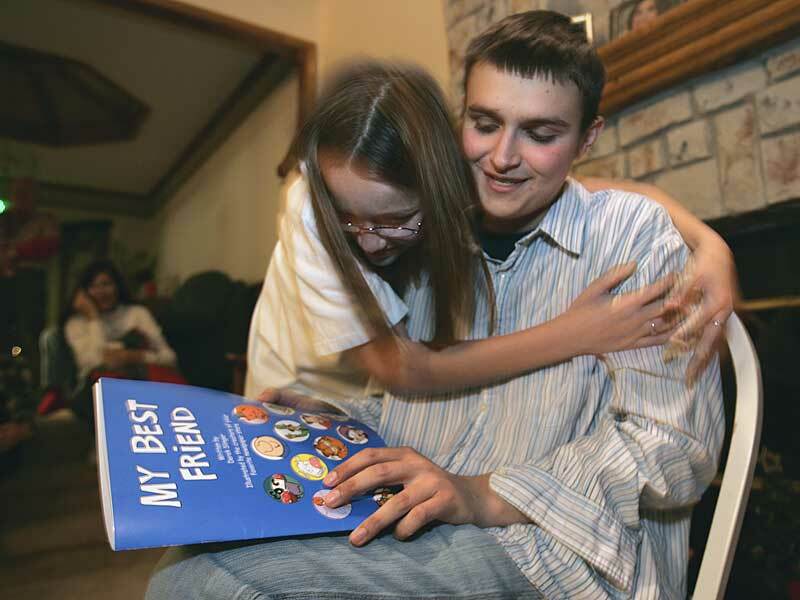 As the paper fell away, Leslee saw the blue coloring book titled “My Best Friend.” She opened to the first page and saw a photo of herself, with her arms around Derek, a photo taken right after her brother became ill.
She began to cry. So did her aunts and uncles and grandparents. Derek grinned, and rolled his eyes just a little. Then he opened the gift to him. Nestled on black velvet, was a silver eagle suspended from a red, white and blue ribbon ---- the Eagle Scout award. An Eagle patch was next to it, along with a gold mentor pin, a mother's Eagle pin, a father's pin and an Eagle tie tack. The doorbell rang again. This time, three men were there, men all wearing scout uniforms. Derek finally understood. “Now I'm gonna start crying,” he said. And everyone there laughed and cried ---- with joy. The Scouts told him he'd done it ---- he was an Eagle, an honor that only 2 percent of Scouts worldwide ever attain. His project was a success. “This book is going to be in every children's hospital in the U.S.” said Dan Barnes, his scoutmaster. “Everybody who knew about this project, who touched it, who helped it to be, gained a little bit tonight,” said Mark Grant, a scout leader and Raytown fireman, who handles Eagle awards for the Boy Scouts. They asked Derek what his strengths were, what he had learned by being in scouts, what it meant to be a leader, or to be of service to someone weaker than yourself. Leslee watched it all, listening to the questions and Derek's answers, sometimes peeking around from an aunt's shoulder, sometimes walking by them so she could hear better. And maybe because she was just 12, she had a question, too. A very serious question for this time of year, one that she dared only whisper to someone who loved her, afraid for anyone else to hear. “Mom, who were those people really at the door tonight?” she asked. “They were elves,” Slinger answered, her eyes twinkling. “They were elves,” said Tammy again. Leslee stood there quietly. Thinking. A cousin told her two days earlier that he was certain there was no real Santa Claus, let alone elves.